I can make that hat! My original piece. Side one. This last December K and I went to a Christmas Festival where, at a couple of different booths, I saw the same style of hat on display. They were soft and stretchy and very comfortable. And the design was a very simple one. I immediately thought ‘I can make this’. A week or so later I saw one of my team at work wearing one and she claimed it was her favorite winter hat ever. 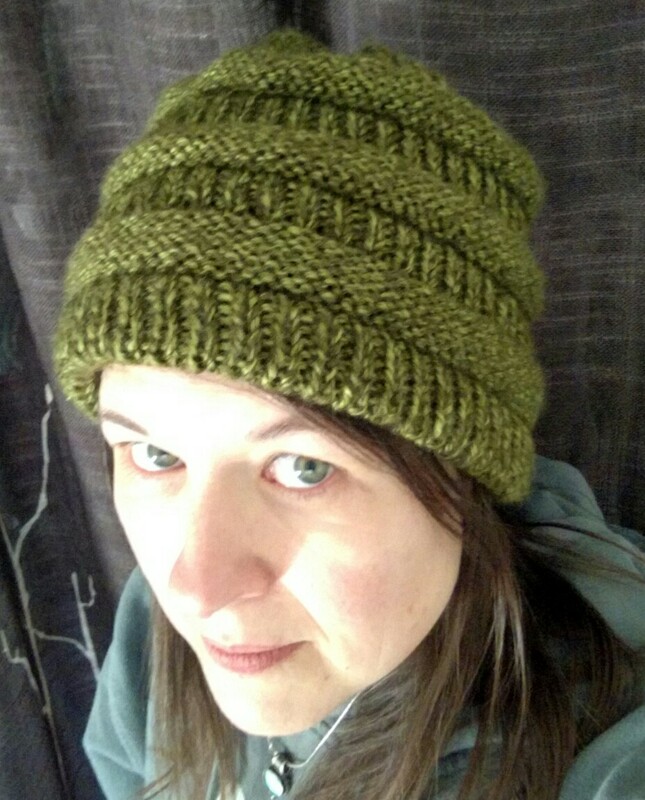 So I took the opportunity to take a couple of pictures, bought some wool blend yarn and had a new hat of my own, and one that was a perfect match to my winter down filled coat, within a day. And the best part was- it was reversible! This winter has been a terribly cold one. More nights in the single or negative digits, and more days below freezing, with snow staying on the ground for the entire season, than in any other recent winter I can remember. So I’ve had a lot of opportunity to wear my new hat – even indoors. One of the nice things about this pattern is that because of the purled rows that round in, it is super stretchy and one size will definitely fit most. Several of my coworkers have asked that if they picked out a yarn, would I make one for them? Which I said yes to, of course. 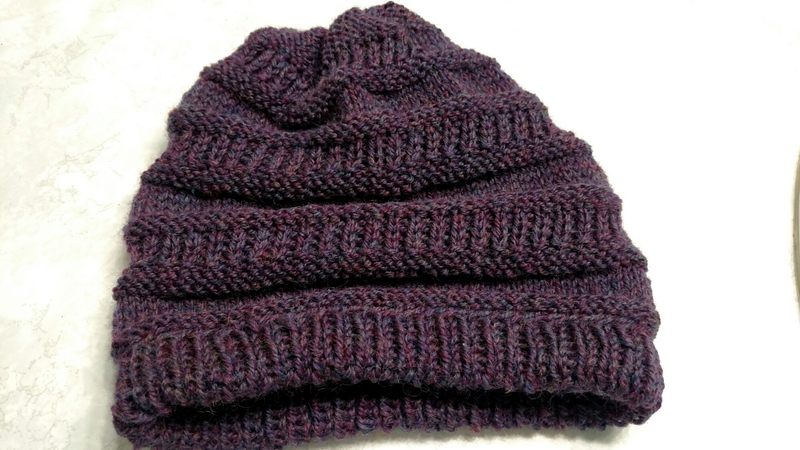 Though I hadn’t planned to do any other project until the yarn arrived for my cardigan I found myself with idle time yesterday and decided to knit a second hat – and this time to write down the pattern. So here it is. You may recognize the yarn as that from the practice swatch for the cardigan. Materials: 1 skein DK/worsted weight yarn, US 7 16″ circular needle, US 7 DPNs, embroidery or cross stitch needle for finishing. CO 100 stitches to circular needle, leaving a long tail of about 18 inches. R1. K1, P1. Cont to end. Place marker if desired. R15-16. K to end. Two rows total. R17-22. P to end. Six rows total. R23-24. K to end. Two rows total. R25-28. K1, P1. Repeat to end. Four rows total. R29-56. Repeat R15-28 twice more. Begin decrease. Switch to DPNs when needed. R 58. K23, K2tog. Repeat to end. R59. K22, K2tog. Repeat to end. R60. K21, K2tog. Repeat to end. R61. K20, K2tog. Repeat to end. R62. K19, K2tog. Repeat to end. R63. K3, K2tog. Repeat to end. R64. K2, K2tog. Repeat to end. R65. K1, K2tog. Repeat to end. R66-67. K2tog. Repeat to end. 8 sts. Finish by threading the end of the yarn through the 8 stitches, pulling tight. Weave in ends cleanly. Fold under the bottom edge, to the bottom of row 15. Using tail, sew along the edge being careful to keep it loose enough to allow for stretching. My original piece, side two (the reverse). I hope you enjoy. If you decide to make one of your own I’d love to see it! 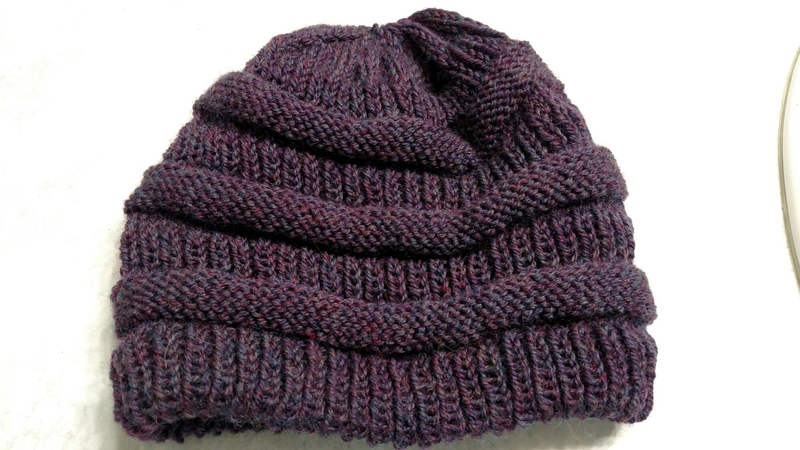 The second hat. I do love this color. I may have to keep it for myself! Your welcome! Can’t wait to see it. I think I might try that! That is, after I finish the 2 or 3 other projects I have started.